I know that in Terminator Salvation, you had these machined guards making sure that no humans were able to indulge in some hanky panky to escape from their prisons, but that is still a very, very far scenario in the future – and hopefully for humanity’s sake, not one that will happen. After all, to be enslaved by a race of robots is not an idea that is worth thinking about, no? Well, we have some semblance of what future prisons would look like – hailing from South Korea, what you see on the right would be a prison guard roobt prototype that will go on trial in March next year. In fact, a jail that is located in the eastern city of Pohang intends to run a month-long trial, where a trio of such automatons will enter into action in March 2012. I suppose if the automaton would be like the Destroyer in Thor, prisoners will definitely toe the line, don’t you think so? After all, if Frost Giants would shiver in fear (pardon the pun) at the sight of the Destroyer, it makes sense for us puny humans to feel the same as well. 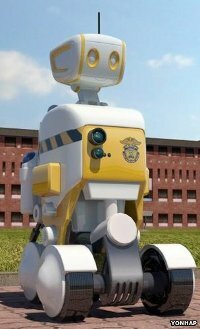 To know more about these robotic prison wardens, head on after the jump. These robots’ main function is to monitor inmates for any form of abnormal behaviour, and according to researchers, this will further help in reducing the workload for the other guards. South Korea, after all, has the aim to be a world leader when it comes to the field of robotics, and business leaders do think that this particular field has plenty of underlying potential to become a major export industry. These prison guard robots are not intimidating in size at all, considering how they are stand 5 feet in height. The robots involved in the prison trial are the handiwork of the Asian Forum for Corrections, which is a South Korean group of researchers currently specialize in criminality and prison policies. These robots will move around on four wheels, and they will feature cameras as well as different kinds of sensors to help them in their primary task, that is to detect risky behaviour including violence and suicide. Human guards will be alerted in case problems are discovered, and according to Professor Lee Baik-Chu of Kyonggi University, who is the leader of the design process, “As we’re almost done with creating its key operating system, we are now working on refining its details to make it look more friendly to inmates.” It would be interesting to see if this particular model of prison monitoring will be replicated in other prisons around the world.